The Department of Science and Technology (DST) holds the annual Women in Science Awards (WISA) to recognise and reward excellence by women scientists and researchers, and profile them as role models for younger women. Renee Kraan-Korteweg pioneered radio astronomy in the Western Cape when she took up the chair to head UCT’s astronomy department in 2005. In 2006, she was behind the launch of an astronomy major, and she says she immediately offered the first radio astronomy research projects to young South African postgraduate students. She also brought the first radio astronomy Research Chairs to South Africa. Loretta Magagula obtained a BSc in biochemistry, molecular and cellular biology, and physiology at the University of the Witwatersrand, a BSc(Hons) in biotechnology at the University of Pretoria, and an MSc in clinical science and immunology at the University of Cape Town. She is currently pursuing a PhD in chemical biology at UCT as part of the Biomedical Translational Research Initiative. Her project focuses on identifying and visualising specific breast and colorectal cancer-causing mutations in the South African population in a field that is almost entirely dominated by Eurocentric data. Keneilwe Hlahane obtained a BSc in geology from the University of KwaZulu-Natal, followed by a BSc(Hons) in geographic information systems (GIS) at UCT, where she is currently enrolled for an MSc in GIS and remote sensing. Hlahane's master's project focuses on monitoring eutrophication using GIS and satellite remote-sensing in the Vaal River. Eutrophication is a leading cause of water pollution in freshwater and coastal marine ecosystems. Alison Lewis, dean of UCT’s Faculty of Engineering & the Built Environment, received the award for her overall contribution to research and innovation in the physical and engineering sciences. Her longstanding interest in water and water treatment in an increasingly water-scarce South Africa led to her research into the treatment of acid mine drainage. This resulted in a process called eutectic freeze crystallisation (EFC), which converts contaminated mine water into clean potable water. Belinda Speed is currently completing her doctorate in forensic medicine in the Department of Pathology. 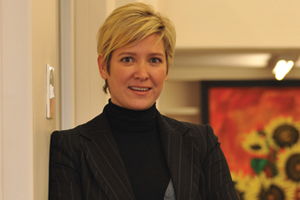 Using pig carcasses as a substitute for human bodies, her research focuses on the baseline decomposition rates of bodies in the marine environment in the Western Cape climate; and aims to provide comparative data that can be used by local forensic anthropologists to help identify bodies and provide sound evidence in court cases. Speed hopes that this will provide closure to families who have lost loved ones. Gina Ziervogel is senior lecturer in the Department of Environmental and Geographical Science and research fellow in the African Climate and Development Initiative (ACDI). She was honoured for her research in climate and development. Her work focuses on those most exposed and vulnerable to climate change and variability. Genevieve Langdon, professor in the Department of Mechanical Engineering, was recognised for her work in the development and evaluation of blast-resistant materials and structures. Her work aims to better understand how important structures such as public buildings or transport systems respond to explosion. Langdon performs actual explosive detonations under carefully controlled conditions, making her work unique in the world. Lillian Artz is the director of the Gender, Health and Justice Research Unit (GHJRU). She has published extensively on domestic violence, sexual offences, incarcerated women and women’s rights to freedom and security in Africa. She has worked on criminal justice and public health care reform in southern and East Africa for over 20 years. She received the 2nd runner-up award in the 2013 Women in Science Award for her groundbreaking work on gender violence. Michelle Kuttel is associate professor in the Department of Computer Science. She does cross-disciplinary research in computational science, employing computational models, analytical methods and innovative algorithms to probe scientific problems. Her research in this field is in the areas of computational chemistry, computational astronomy (which includes the development of software and computational approaches to support the new Square Kilometre Array (SKA) in South Africa), parallel and high performance computing, and scientific visualisation. Sindiso Mnisi Weeks completed her doctorate in law in 2009 at the University of Oxford, where she was a Rhodes scholar. At the time of this award, Mnisi Weeks was a senior researcher in the Law, Race and Gender Research Unit at UCT, working on the rural women's action-research project. Her main concerns have been with rural women's exclusion from law-making and decision-making practices in traditional communities, as well as their participation in national legislative processes. Using methods that include rural women's participation, she has publicly challenged these forms of exclusion and the implications they have for rural women's ability to attain social and economic security.